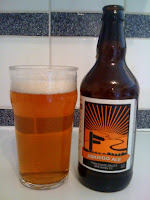 It’s about time I got round to writing up my BeerSwap tasting notes and thoughts. My sender was Andy from BeerReviews.co.uk meaning a selection from the North Yorkshire coast. If at this point you’re wondering what a BeerSwap is, you might find this link useful: link. In essence it’s an organised blind swapping of local beer with the focus on sharing great local favourites, then using social media to tell everyone your thoughts on them. Anyone can join, so stay tuned for the next one if you’re interested. 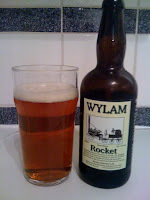 Wylam Rocket comes packaged in the type of bottle you’d expect to find in a National Trust gift shop. Plenty of information about trains but nothing about the beer inside! It’s got the look of those preserves you sometimes see, the ones that have a faux home made paper label but are all made at the same massive factory in some major city. Never judge a book by its cover they say, and you’d do well to heed such advice when it comes to this beer. It’s bready and malty with the slightest suggestion of floral hop. The bitterness is crisp, clean and refreshing. It’s uncomplicated but delicious and made the ideal accompaniment to the Pizza I was eating at the time. Yorkshire Dales Askrigg Ale is golden-copper in colour with a bright, zesty aroma that’s dominated by Amarillo hops. On the palate its biscuit, grapefruit and orange, leading to a dry, pithy bitter finish. Harsher critics might argue that it’s a touch thin in the mouth, but for refreshment value it’s spot on. Pale and hoppy done, time for something a bit darker. Centurion’s Ghost Ale from the York brewery is 5.4 per cent, dark ruby and topped with a lacy, silky, white head. The aroma is packed full of bitter chocolate and roasted grain, this comes through on the palate and is accented by the faintest suggestion of floral hop. There’s something smoky going on and then a subtle bitterness to the finish. Beautifully crafted and absolutely delicious. Expertly packaged with great care, my bottles made it to me without so much as a scratch. Thanks to Andy for that and for taking the effort to pick out some really great beers for me. Andy also included a bottle from The Durham Brewery which I’m saving for another time. Had a fantastic pint of Askrigg on scorching hot day in Hull last year. Centurion's Ghost just didn't float my boat, though. 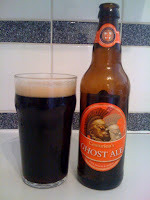 I agree with your description of the Centurion's Ghost (the one of the three that I have tried). I enjoyed it's sweetness along with the roasted, got a firm [baron rating 4/5]. TBN: Wouldn't mind trying the Askrigg from cask. Like you say, on a hot summers day I bet it went down a treat. Baron. Thanks for the positive feedback :) I liked the Centurion a lot, really nice. Glad you enjoyed them, it's hard finidng exciting stuff round here, we are firmly in the Brown Bitter Belt with the exception of one or two places which don't seem to bottle their ales, or if they do they don't travel well. I look forward to comparing notes on the Durham one, just got my self a bottle to try. Askrigg on cask is great, Centurions Ghost in the York Brewery Bar was great too, a proper winter warmer, it does seem to divide opinion though.